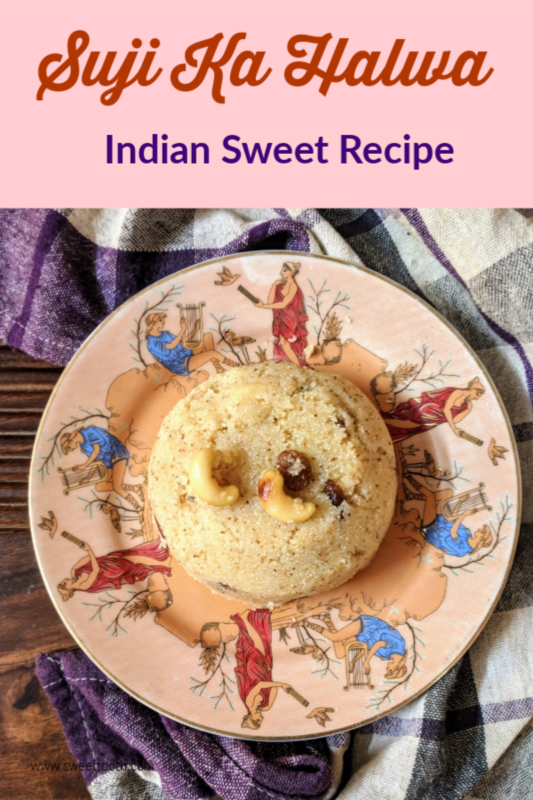 Sooji ka Halwa or Sheera Recipe is an easy halwa recipe or Indian sweet that is very commonly made in Indian homes for poojas, festivals or just as a delightful sweet. Suji halwa is very quick to rustle up and is really delicious. It uses very few ingredients and is very easy to make. 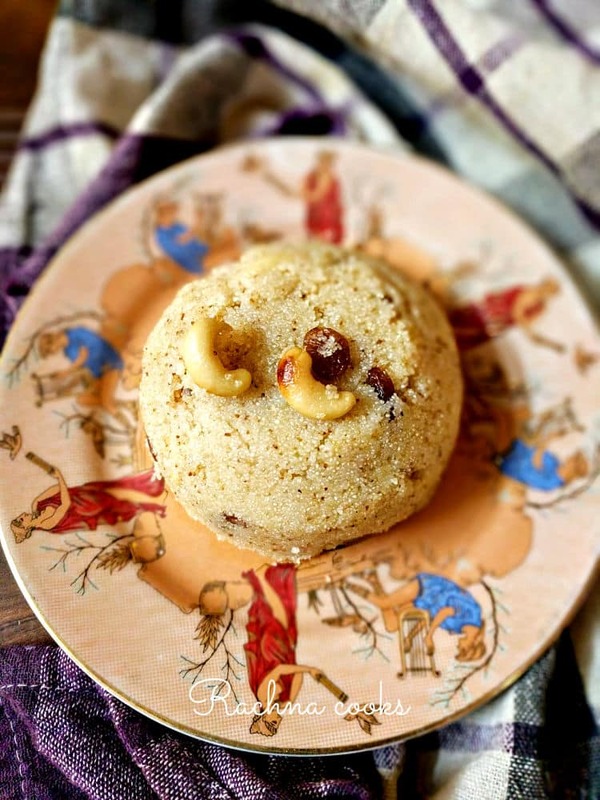 In most Gujarati homes, sheera is commonly served with food. It is delicious served hot. And don’t hold back on the ghee when making this. This is an easy and tasty recipe of Suji ka Halwa. It is made with semolina and is really delicious. Made as a sweet or as prasad in Janmashtami, Navratri and Diwali. 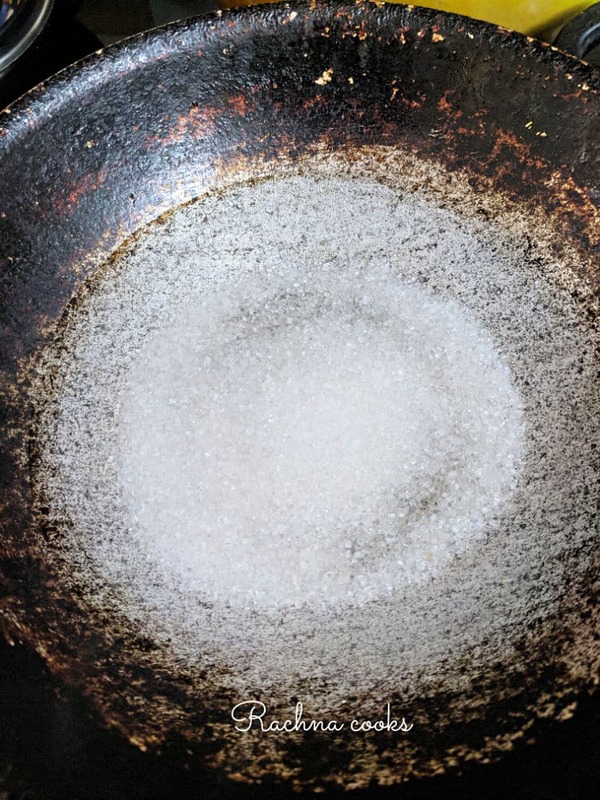 Heat ghee in a pan/kadhai. 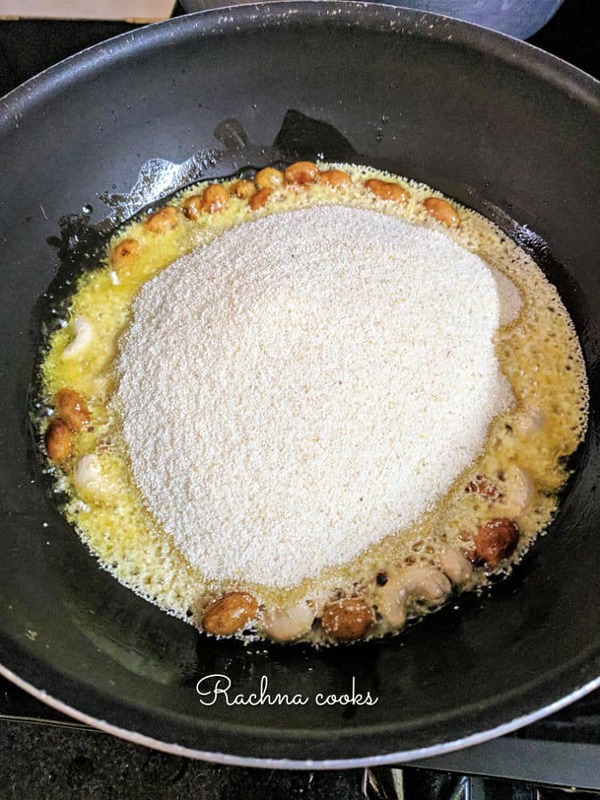 Put cashews, almonds and raisins and fry till golden brown. Now add the rava or sooji to this hot ghee. Fry on medium heat till rava is golden brown. Takes about 10 minutes. Boil 1 cup water in another pan. Add 1 cup sugar to it. Let the sugar completely dissolve and allow it to bubble for 3-4 minutes. To the rava add cardamom powder and milk. Be careful as the milk will sizzle and sputter. 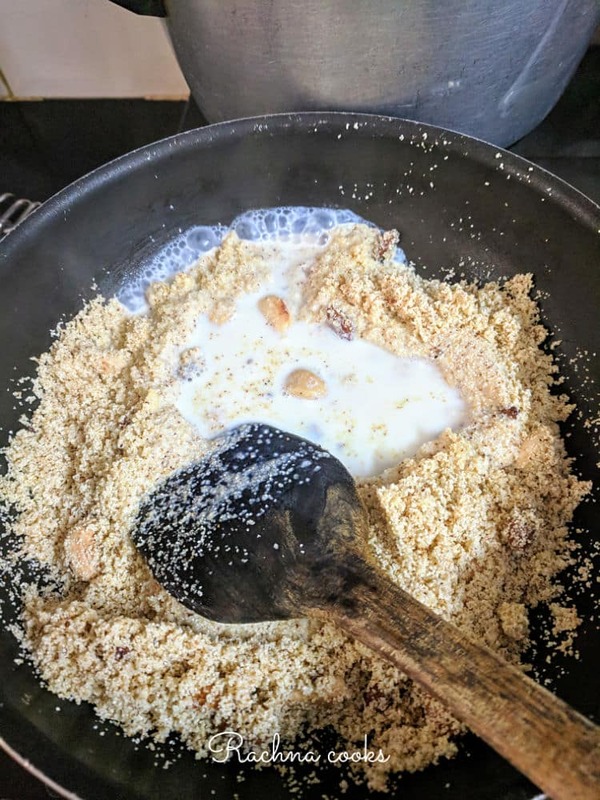 Once the milk is incorporated add the hot sugar water or chashi. The rava mix quickly absorbs all the liquid and fluffs up. Ensure that you’ve put adequate liquid in. Cover and cook on low flame for about 5 minutes. 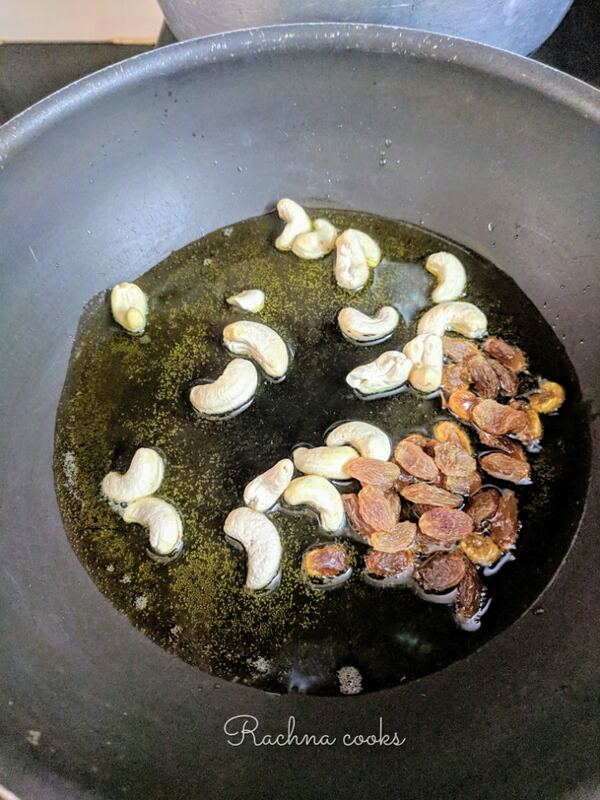 Garnish with some fried cashews. Your delicious rava sheera is ready to serve. You can use any combination of nuts. You can increase the quantity of ghee if desired but don’t reduce it or your halwa will be very dry. You can skip milk if you want to. Just add more water in its place. Milk makes the halwa softer. You can easily store this in the fridge for a week. Just heat it and serve. You can reduce or increase the quantity of sugar depending upon the sweetness you prefer. I prefer low to medium sweet. Hope you liked this recipe of suji ka halwa. Make this for Prasad during Janmashtami, Navratri or Diwali or any other festival time. It is also a popular Prasad for Satyanarayan poojas. It really is simple to make. If you liked this sheera recipe do share with your friends. For more festival recipes click here. This was the first recipe I was taught in my Home Science class. Yummy ? My favorite. Loved the Suji Halwa recipe ? Wow! That looks delicious! And I am not even overly fond of sweets! That looks delicious, even though I’m not a big fan of suji halwa. Yummm! 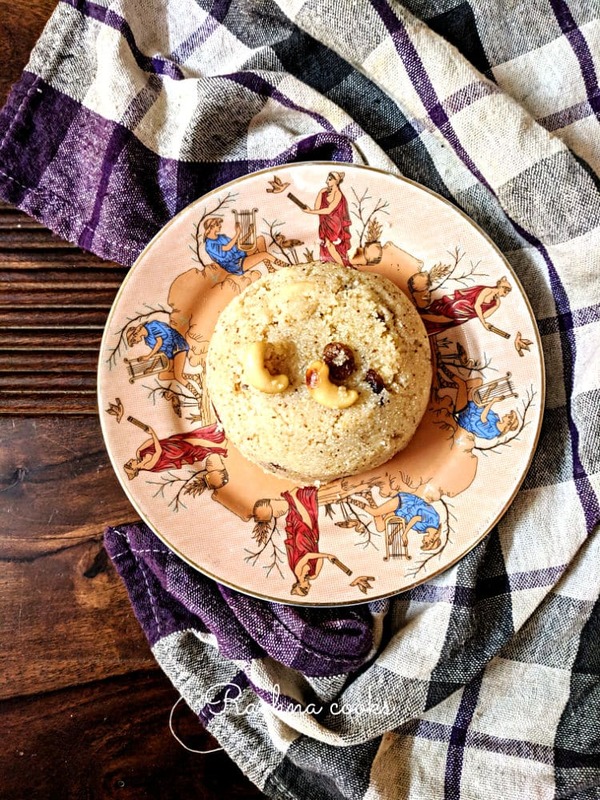 We make this every year during Navratri, thanks for sharing the step by step pictures and the recipe notes in the end. Not a fan of sweets but I do make this occasionally. I do not make a sugar syrup and add it to the rava, I directly add the water and add sugar at last. Very easy to make and always a handy dish when people visit. I of course add kesar and silver wark to make it all pretty for some important people ?